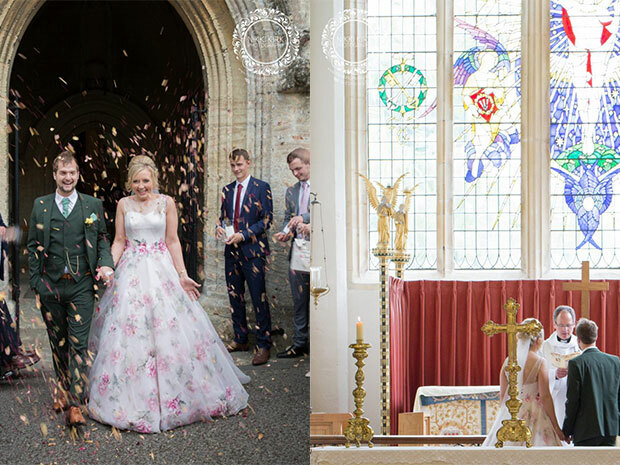 School sweethearts who tied the knot within the picturesque setting of Manor by the Lake… prepare to be inspired by this stunning flower-filled Real Wedding, captured by Nikki Kirk Photography. Flowers: Handmade (thousands of them!) by mother of the bride, Rachel Beaton. 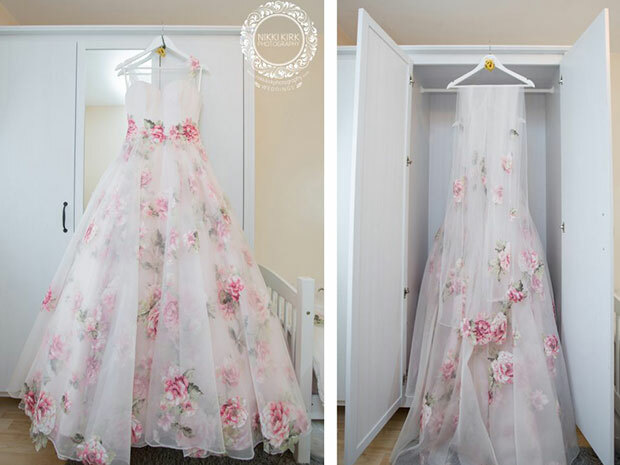 Dress: ‘Marylin’ by Sassi Holford with matching ‘Rose’ long veil, from Cotswold Bride. With the bridal gown, Georgina (bride) and her seamstress friend Carol, hand-stitched extra rose appliques upon the skirt. 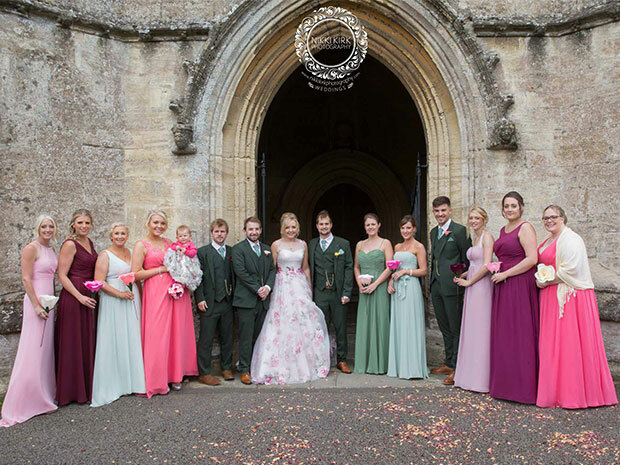 Bridesmaid dresses: Nine different shades and styles by Alfred Angelo, ranging from forest green through to deep mahogany; all colours found within the rose print in the bridal gown. 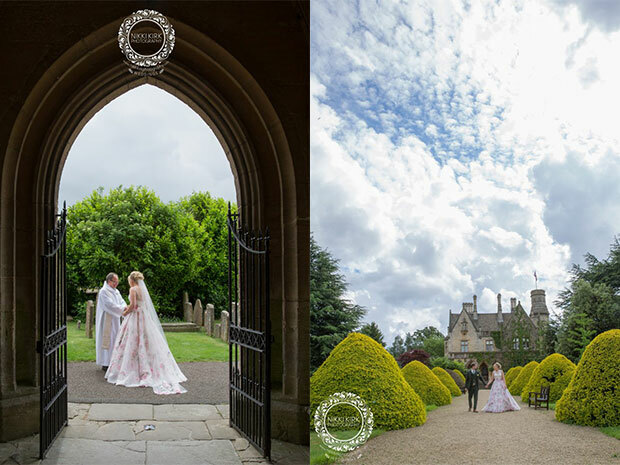 All purchased from Cotswold Bride. The flower girl dress was purchased from Monsoon as a ‘mini-me’ bride. Groom’s outfit: Three-piece forest green suit from ASOS; pink and white stripe shirt from River Island; brown brogues with rose print on the sole from Jones Shoes; cravat from Slaters. Cake: Pryers Kakes. It had three tiers with Victoria sponge, chocolate cake and coffee cake, and a hand-painted layer to match the bride’s dress. Stationery: Save the dates and invitations by the groom’s brother, Graham Cheal Invites. 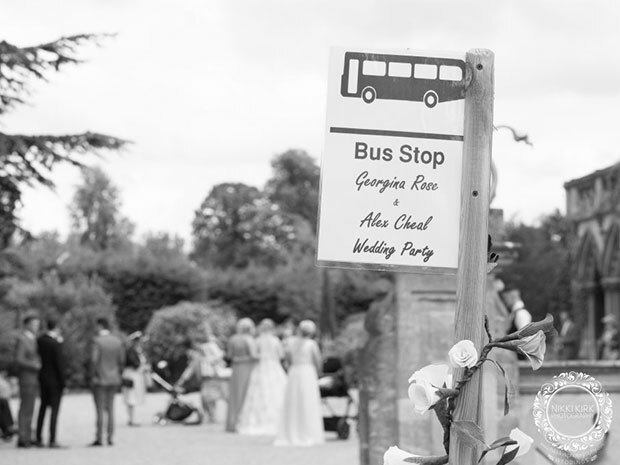 All the other stationery was designed by the bride and groom, and created by Georgina. Favours: Honey jars with personalised stamped spoons, finished with home designed and made labels that said ‘Meant to Bee’. The ladies had a gold rose charm (representing the bride) and the gents had a gold football charm (representing the groom). Alex hand-stamped each and every single spoon for each guest and Georgina designed and made the ‘Meant to Bee’ labels. Entertainment: Garden games and crazy golf at Manor by the Lake; music from Steve Jermott; and DJ G. HUBB. Hair and beauty: The bride and mother of the bride by Kelly Nottingham from McAdams. The rest of the bridal part by Jennifer Davies Hair and Make-up. Rings including engagement ring: The engagement ring was an antique from Gloucester Docks Antique Centre; the wedding rings were from David Edwards. We first met 12 years ago at sixth form. Alex had joined the school for the first time at sixth form, whereas Georgina had already been at the school. Both were in the same tutor group and it is that every new pupil is to have a ‘buddie’ to show them round the school for the first week or so – Georgina saw Alex and instantly volunteered. Love at first sight! That was in the September and after becoming best friends…. became a couple in the January and saw the new year in together. 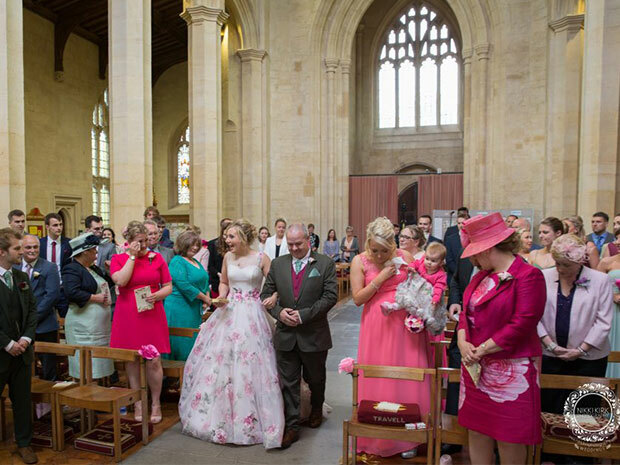 Alex proposed to Georgina whilst they were visiting Northleach Church with their dog Berry. Georgina’s Nanny Rose is buried at Northleach Church and it was Nanny Rose’s birthday. 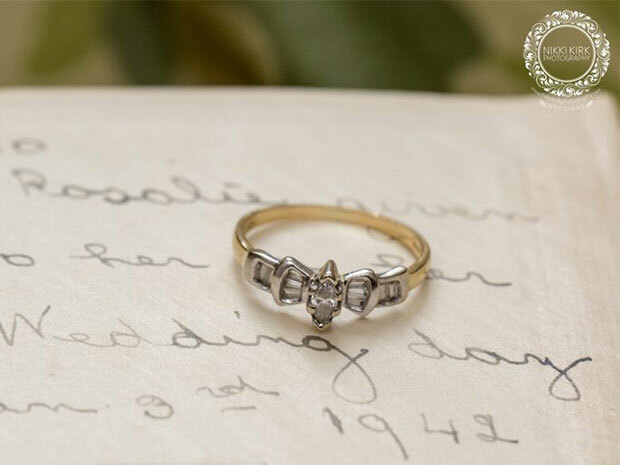 Whilst out there together, in the porch of the church, Alex got down on one knee in the rain and gave the postman a shock – hehe! Around 18 months to plan the wedding. 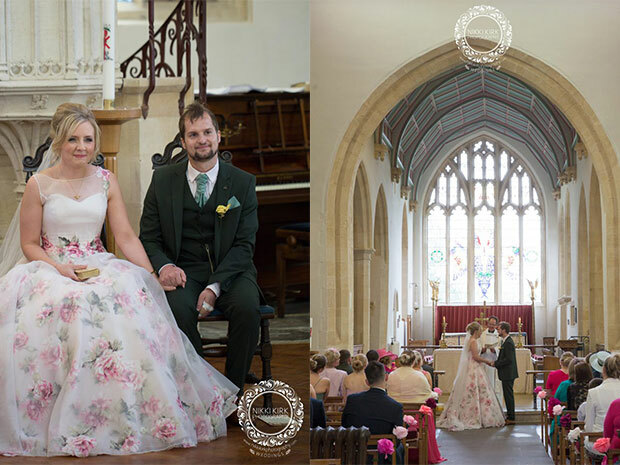 Northleach Church: Georgina’s grandparents and great grandparents were married at Northleach Church and Georgina’s Nanny Rose and family is also buried at Northleach Church and so Northleach had become a very special place for both Alex and Georgina. It’s also the place where Alex chose to propose! Manor By The Lake: Both fell in love with the place the instant they walked in. It is also just around the corner from Georgina’s parents’ home and from Alex and Georgina’s school where they met. Georgina also did her first ever photo shoot for her designs at Manor By The Lake. 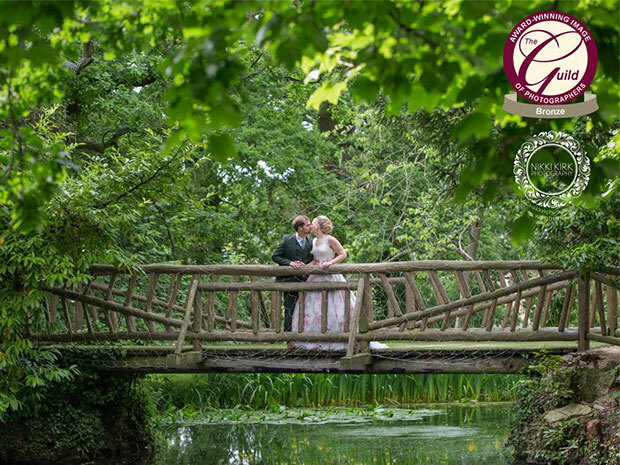 Alex & Georgina also loved Manor by The Lake as it felt like a huge family home where everyone can feel at home as well as having a fantastic day – the food also captured Alex! 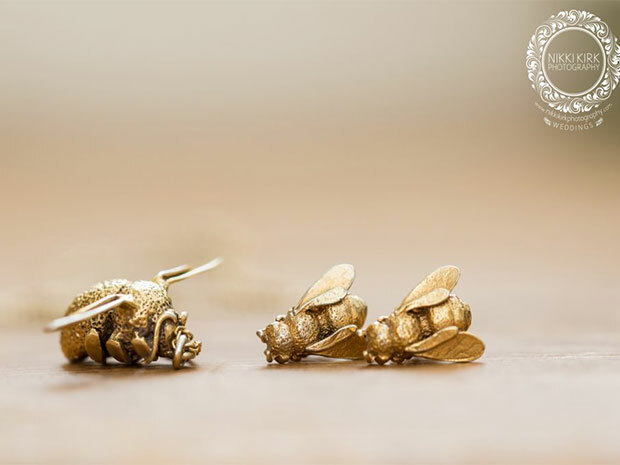 Bee’s: ‘Meant to Bee’ – Alex and Georgina adore all animals, down to the tiny bees. Alex over the years has also always bought Georgina gold bee jewellery from designer Alex Monroe. Roses: Very close to Georgina’s family and heart. Not only Georgina’s middle name but favourite flower which represents her Nanny Rose who taught Georgina how to sew. Choosing the photographer was easy. Not only as Nikki was a friend through work but Georgina has worked with Nikki on a few Bridal photo shoots and understood Nikki’s ways of working. 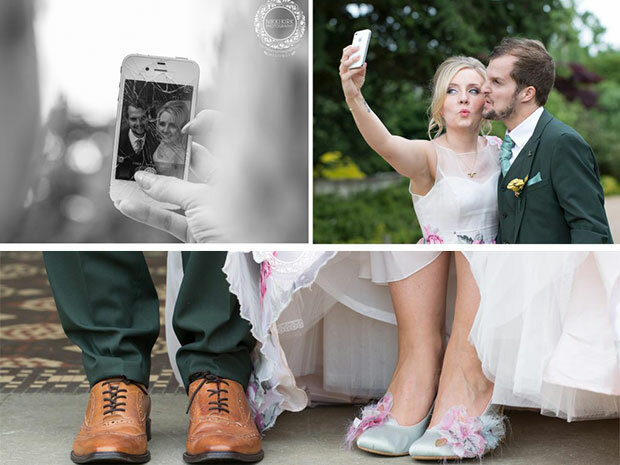 Both Alex and Georgina loved how professional, yet warm Nikki was, and fell in love with her work – especially how Nikki captures every tiny detail. There were so many tiny gestures that represented so much at the wedding for the couple and they knew Nikki would not miss a thing. 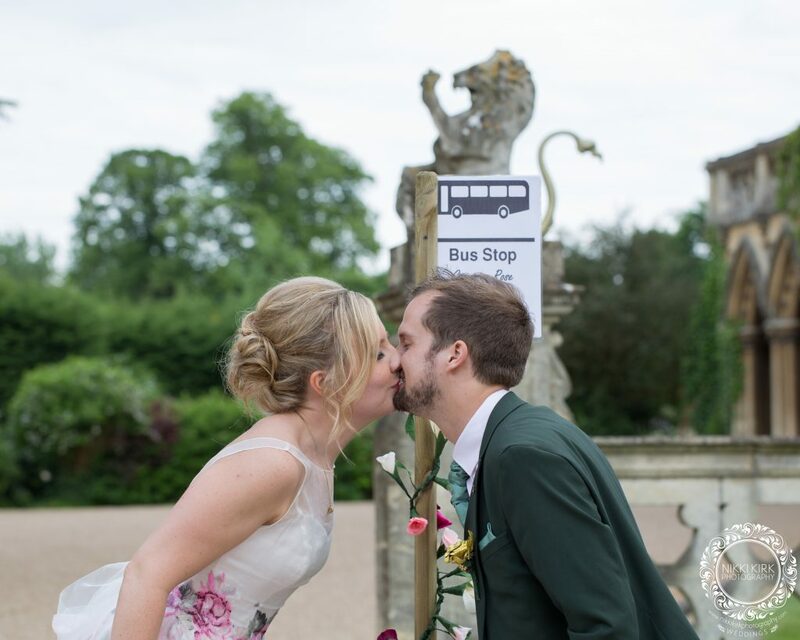 Nikki captured every aspect of the day, including the tiny gestures and memories that guests may miss but that Georgina and Alex knew were there. 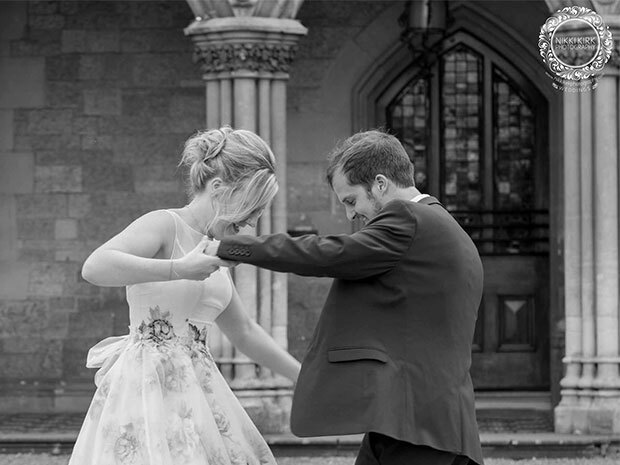 Nikki also ensured that Alex and Georgina were captured as having fun… not doing standard wedding photography. 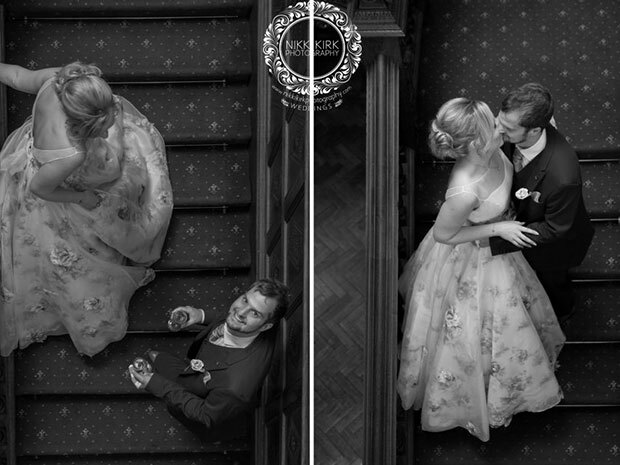 Nikki was able to capture the relationship and fun, just getting the couple to be themselves – she never missed a detail! A total DIY affair! 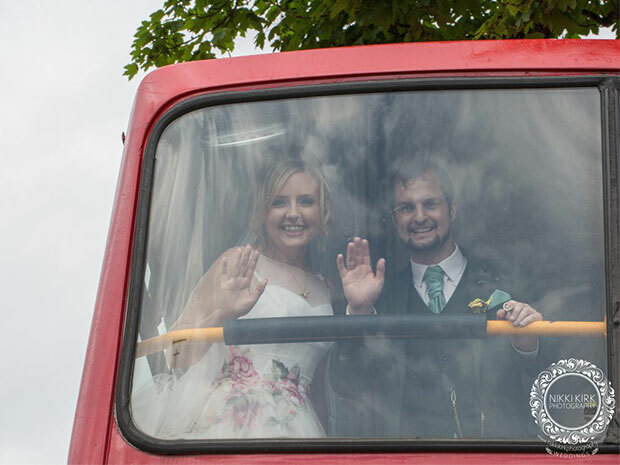 As there were so many personal details, memories and gestures Alex and Georgina loved designing and creating everything. Rachel (Mother of the Bride) was very hands on as she’s very creative. 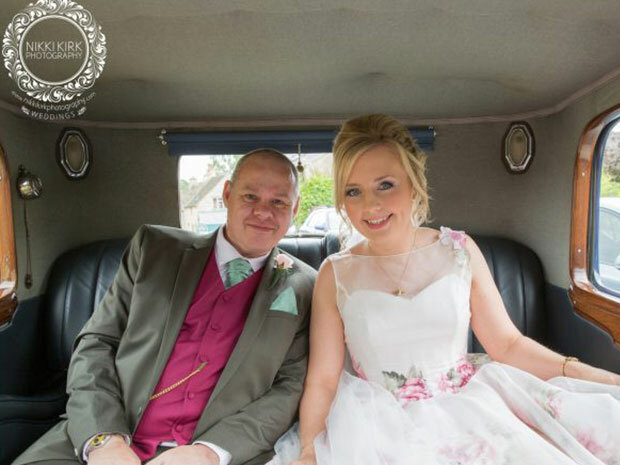 Georgina, as a wedding dress designer and sales assistant, also knew a few tips of the trade and loved being creative. 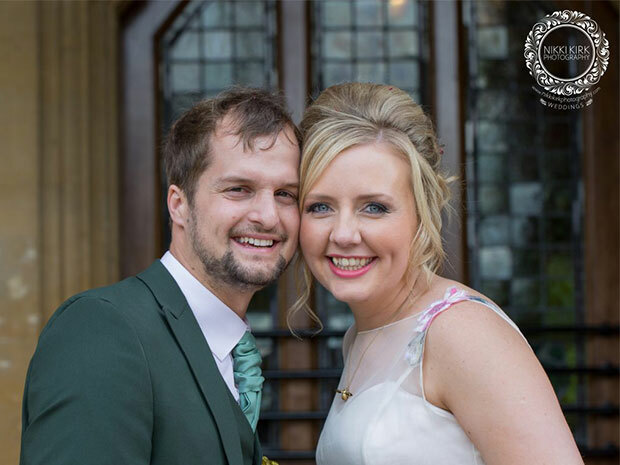 Almost every single aspect of the day was thought about… from the meaning of the order of service selection, to the colour of the cutlery and cups and saucers – everything had a personal meaning to Alex and Georgina. Flowers and top table centrepiece: Made by Rachel, Mother of the Bride. Every single petal was hand cut to create each rose. Favours and centrepieces: Alex (groom) sprayed each candelabra gold and used two gold bees on each one. 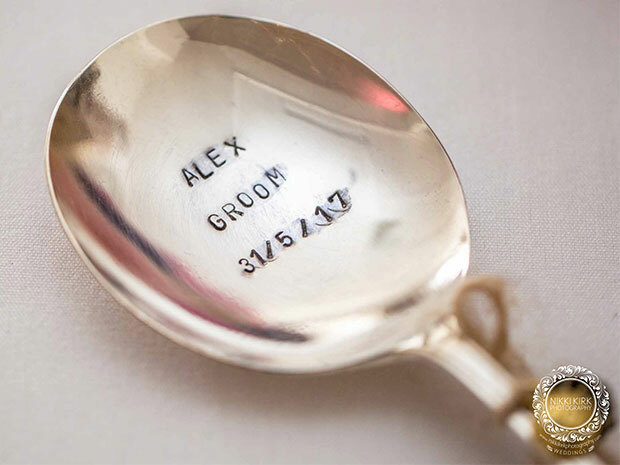 He also hand stamped the antique teaspoons for each guest with their name. 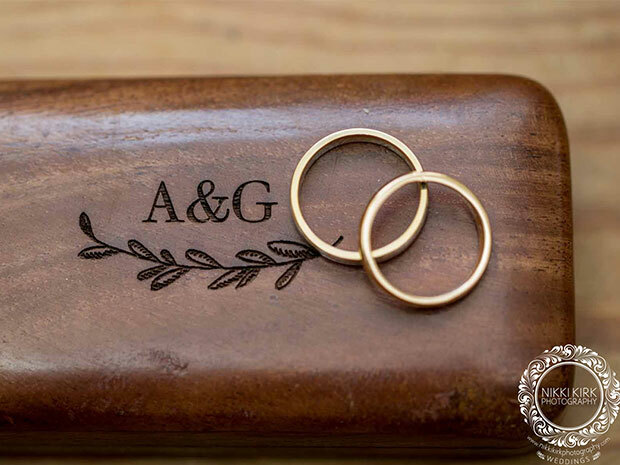 Any small touches – table plan, family photos, order of service, table charms, clothes hangers, gift boxes and more – designed and created by Georgina. 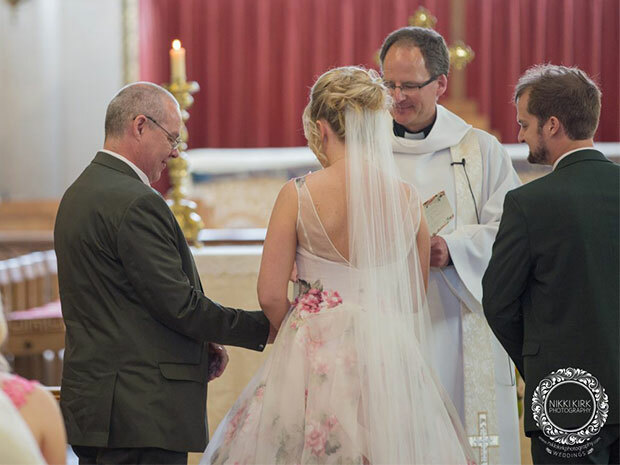 The dress was ‘Marylin’ by Sassi Holford, with the matching ‘Rose’ veil, from Cotswold Bride in Cheltenham. Being a bridal dress designer and working in a bridal shop, Georgina actually found it very hard to find the dream dress. As a designer, it is bad luck to design your own and so Georgina began the search… knowing she wished for something different. 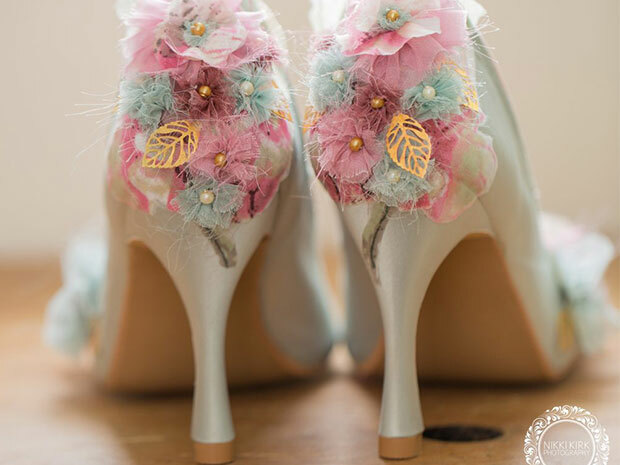 Georgina studied her degree in Taunton where Sassi Holford’s studio is based and saw Sassi as an inspiration in becoming a wedding dress designer. Whilst at The White Gallery in London with the Cotswold Bride team, searching for new designs for the Cotswold Bride boutique… out of the corner of Georgina’s eye, she saw a flash of blush pink and these stunning printed roses over the gown. Ali, the owner of Cotswold Bride (also a Bridesmaid) asked Sassi to show the gown and Georgina burst into tears. The gown was so beautiful and the roses just meant the world as it represents Nanny Rose who taught Georgina to sew in the first place. And of course, with the matching veil called ‘Rose’ it was meant to be. 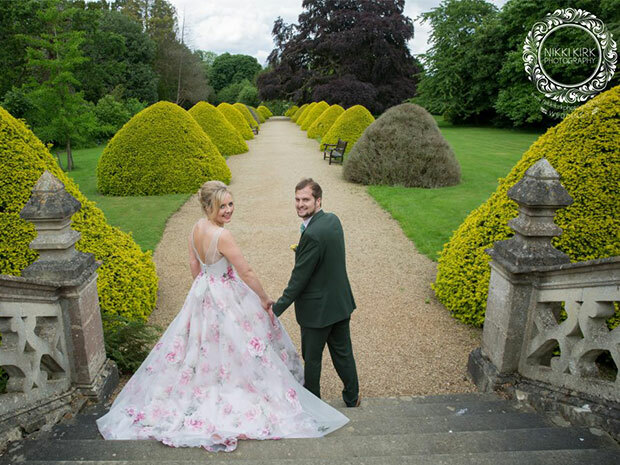 Georgina did add her own details to the gown by hand sewing on extra printed rose appliques and had each colour of the bridesmaid dresses added to the buttons down the back of the dress. Of course, the bridesmaid colours were selected by plucking a tone out of the rose prints in the dress. The suit was from ASOS, a three-piece forest green suit. 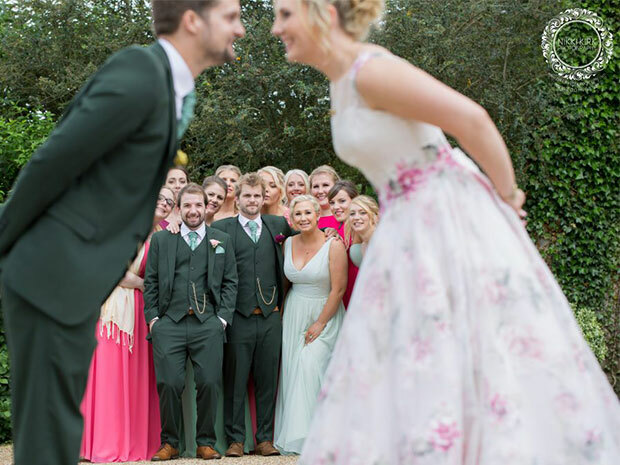 At this point, of course the groom did not know the colour of Georgina’s dress but loved the colour green as it was something different! He also wore a light blush and white thin stripe shirt, and a light green cravat. The button hole was hand-made by Rachel, Mother of the Bride and had two gold bees. 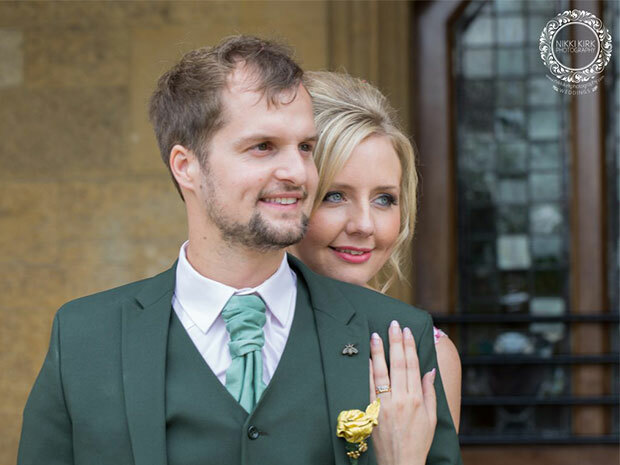 The pocket watch was a rotary gold pocket watch given to groom on the wedding morning from Georgina. The shoes were brown brogues with hidden rose engraving under the soles. Alex also had his two brothers as best men and they all matched together. Georgina did not have a bouquet to carry down the aisle. Georgina instead carried Nanny Rose’s ivory and gold prayer book. The same one that Nanny Rose carried down the aisle when she married her husband at Northleach Church. Blue: Tiny blue bow sewn into the dress by Sassi Holford and Georgina wore an Alex Monroe ring with blue topaz, another gift from Alex over the years. Sixpence in shoe: This was cut and fitted into the sole of the shoe, as the shoes were hand designed and made by Grace Elizabeth shoes (Georgina went to university with Grace). There was a beautiful choir, the Cheltenham Youth Choir, who sang ‘Latch’ by Sam Smith. There was one religious reading given by Alex’s sister-in-law Holly and then ‘Falling in Love is like Owning a Dog’ read by Georgina’s cousin Ollie. The ‘Falling in Love is like owning a dog’ was chosen as Alex and Georgina have always had dogs together. With two cocker spaniels who are really their fur babies… it was so important to have something relating to them during the ceremony. Alex and Georgina had a traditional sit-down meal and the guests were given two choices for their starters, mains and desserts. There was also gold cutlery and gold and ivory crockery – cups and saucers were a must have. Same as what Georgina walked down the aisle to: ‘Latch’ by Sam Smith. Our DJ and friend mixed the acoustic version by Sam Smith to start and finished with ‘Latch’ by Disclosure so everyone could join on the dance floor very quickly. 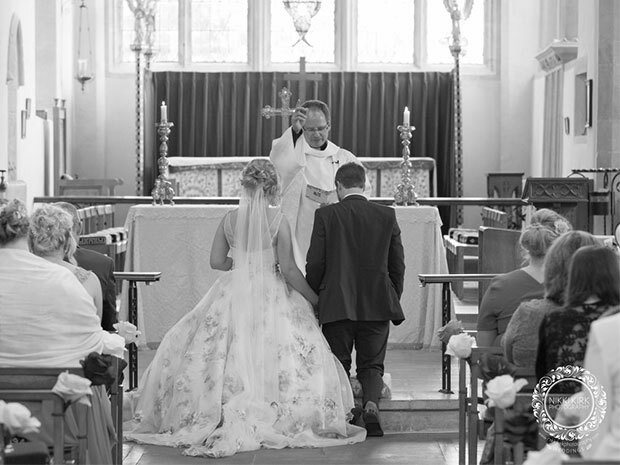 Walking back down the aisle, looking at our family and friends out of the church as Mr and Mrs… knowing that our Grandparents also did these same steps in the same place as Mr and Mrs.
Everything did go to plan and that was down to all the help of fantastic friends and family… and PLANNING – lots of it. Take five minutes away from it all together just to take it all in. The day goes by so quickly and you’re so busy all day that you don’t take time for each other on such an important day. Take five! How fast the day really goes… everyone tells you but you can’t believe how true it is. The days flies by. 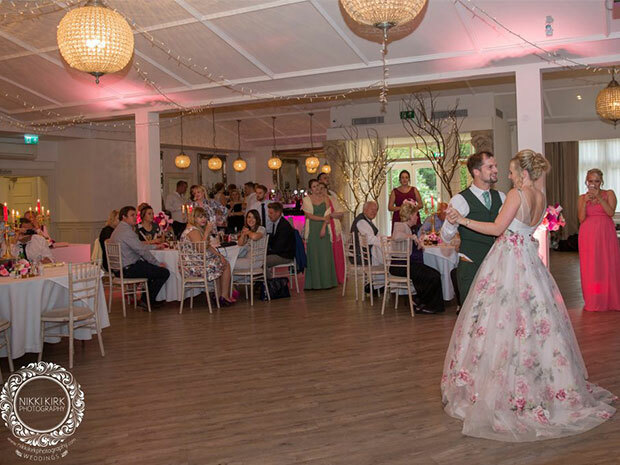 We did originally look at a weekend / two-day wedding and if we were to do it all again, we would extend it by another day – more time to celebrate with family and friends. As yet no honeymoon has been taken but there are lots of plans for a Norwegian Cruise. Alex and Georgina did have a mini-moon for a few days and got an apartment in Paris, along with a few days in Disneyland Paris as both love rides and rollercoasters. 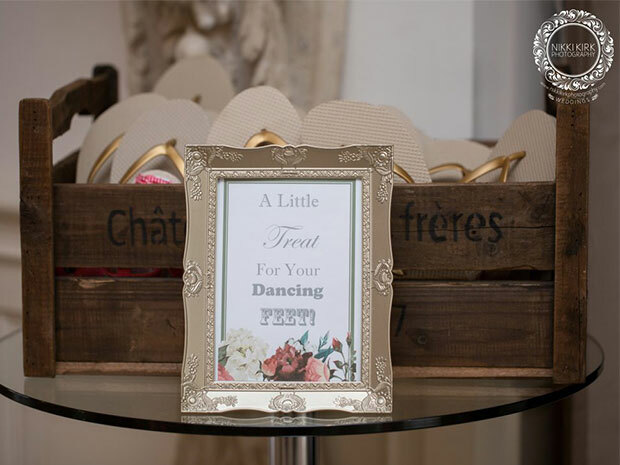 For more information about the venue see Manor by the Lake.